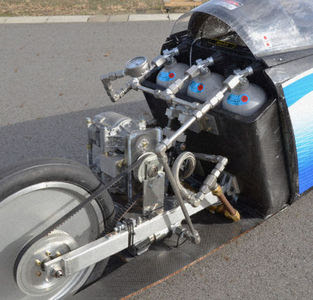 The Toyota Ku:Rin three-wheeler just took the speed record for a car running on only compressed air, clocking in at 80.3mph. The KU:RIN was designed and built by a 40 member team at Toyota group company Toyota Industries Corporation that was started in December 2006. It is no coincidence that Toyota Industries Corp happens to be the biggest supplier of car air conditioner compressors in the world - to the tune of 20 million every year. So these guys know something about compressed air. To power the KU:RIN, these developers reversed an air conditioning compressor so that instead of using mechanical power to compress air, it generates mechanical energy from the expansion of the compressed air. The compressed air is not fuel as such, but acts as energy storage fulfilling much the same role as a battery pack in an electric car.